The Olympic Games is undoubtedly the greatest sporting event in the world, with over 200 countries competing for success. This important new study of the Olympics investigates why some countries are more successful than others. Which factors determine their failure or success? What is the relationship between these factors? And how can these factors be manipulated to influence a country’s performance in sport? This book addresses these questions and discusses the theoretical concepts that explain why national sporting success has become a policy priority around the globe. 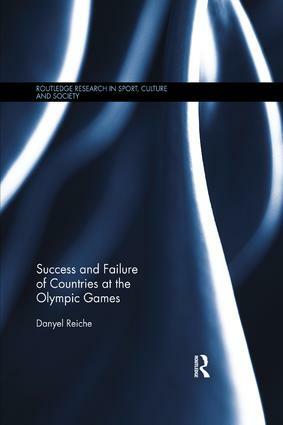 Danyel Reiche reassesses our understanding of success in sport and challenges the conventional explanations that population size and economic strength are the main determinants for a country’s Olympic achievements. He presents a theory of countries’ success and failure, based on detailed investigations of the relationships between a wide variety of factors that influence a country’s position in the Olympic medals table, including geography, ideology, policies such as focusing on medal promising sports, home advantage and the promotion of women. This book fills a long-standing gap in literature on the Olympics and will provide valuable insights for all students, scholars, policy makers and journalists interested in the Olympic Games and the wider relationship between sport, politics, and nationalism.